With the GhosT-OLED you can not only see the images on the screen, but also the area behind it, thanks to its transparency. This enables media installations in which real objects become part of the image. The innovative transparent OLED displays are optionally equipped with the high-performance primeTOUCH technology. This infrared touch solution is secured from disadvantageous light influences, thanks to the IT protect feature. The high contrast image combined with the transparency without backlight make GhosT-OLED a true highlight. 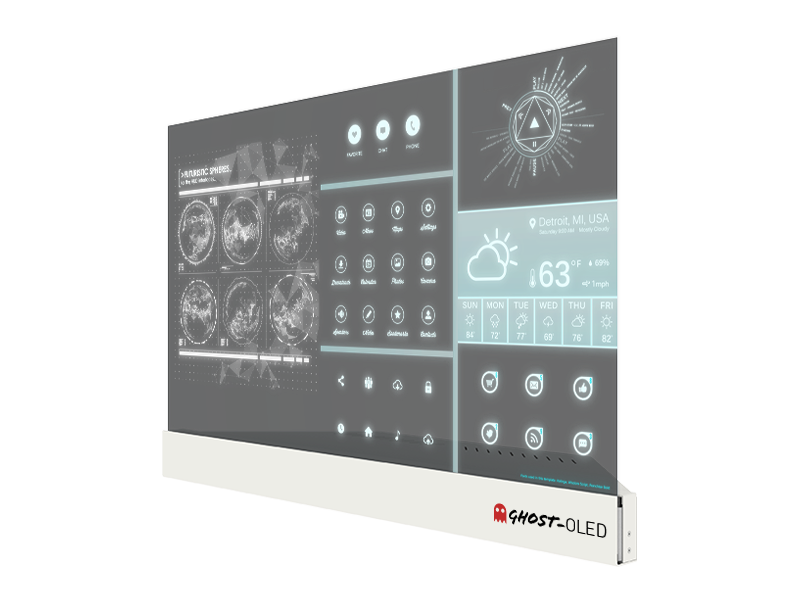 GhosT-OLED offers the possibility for image presentation as well as the transparency to see objects that are placed behind. Therewith media installations can be created involving real objects into the displayed image. This is particularly useful for eye-catching exhibits at fairs, in museums or for retail displays in sales areas. OLED-displays are self-illuminated and do not require backlight. The image reproduction quality, especially the excellent colour contrast, is the strength of this technology. The variety of transparent OLED products will continue to grow rapidly in the near future. 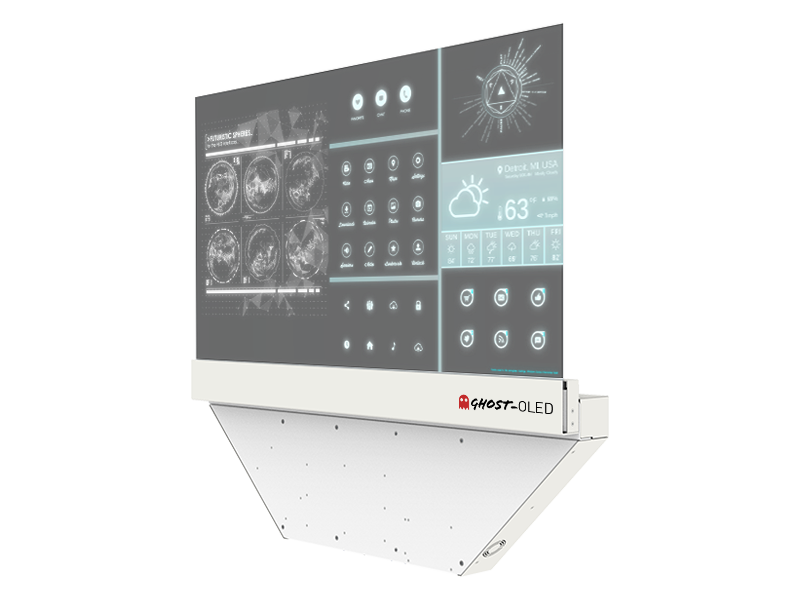 The innovative transparent professional OLED Displays are optionally available with primeTOUCH technology for a stunning multi touch performance. As this infrared TOUCH solution is equipped with the IR-Protect feature, environmental light will have no effect on the system. 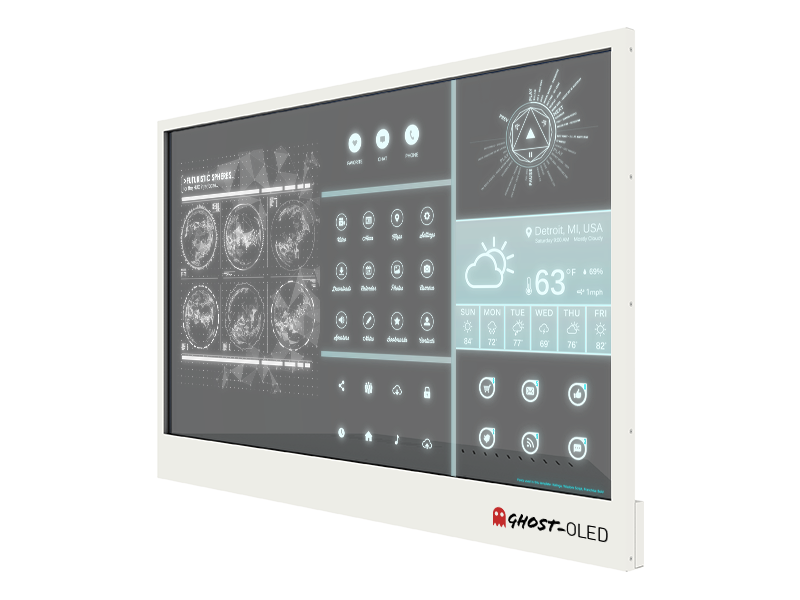 The GhosT-OLED will be available in different versions for rental purposes and also for fixed installations. Of course there can be customised versions adapted to your projects. 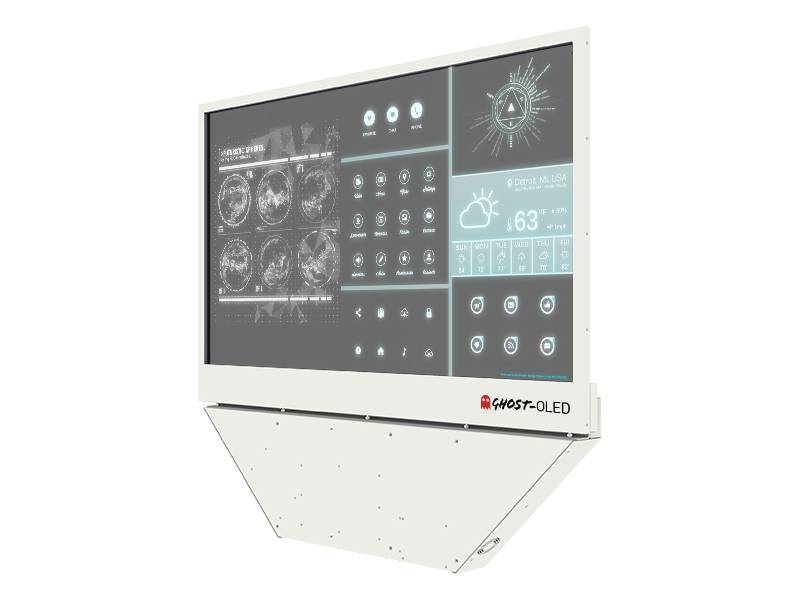 The screen is interactive, equipped with the primeTOUCH technology, which is placed into the frame of the display. Pictured is the model with integrated table stand that contains the control electronics for the display. 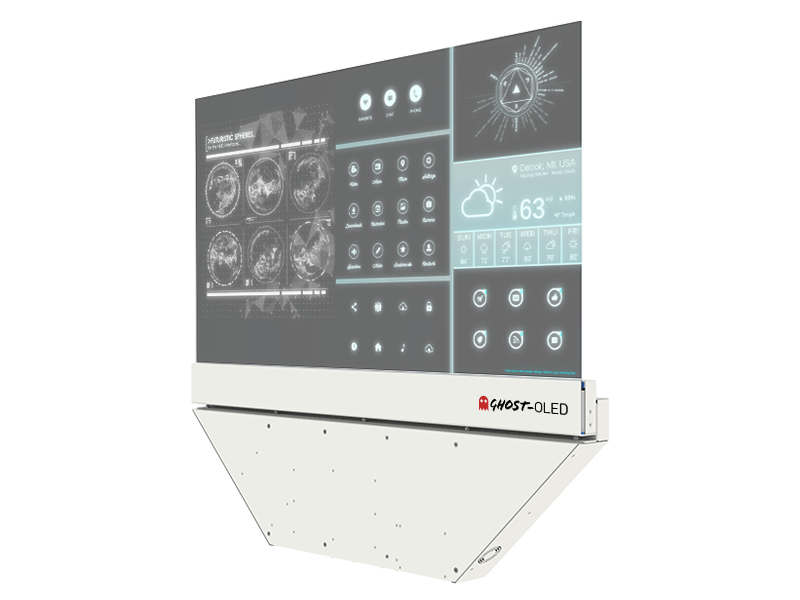 The screen is interactive, equipped with the primeTOUCH technology, which is placed into the frame of the display. Pictured is the model with a straight vertical stand that contains the control electronics for the display. This enables the installation at the exact edge in a wall opening. 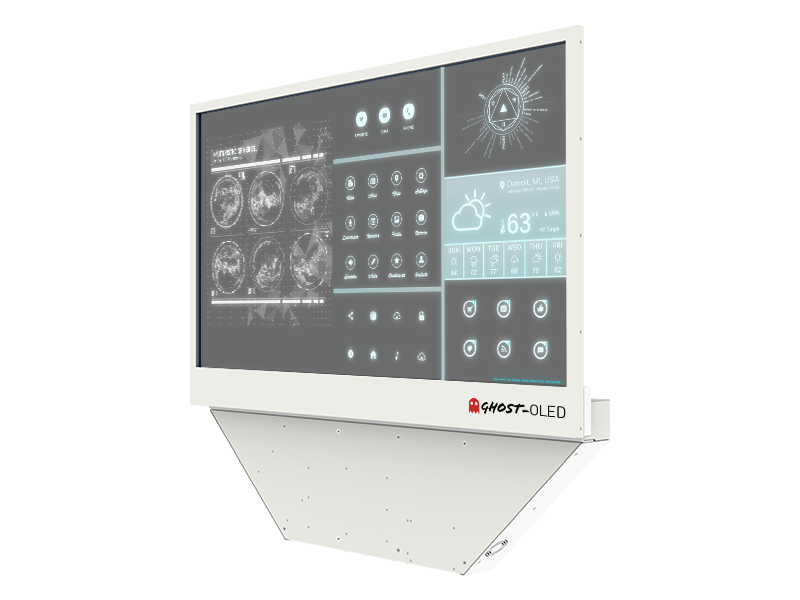 The screen is interactive, equipped with the primeTOUCH technology, which is placed into the frame of the display. Pictured is the model with straight table stand, that contains the control electronics for the display. The no-frame design makes the unit very appealing for fix installations. Pictured is the model with integrated table stand that contains the control electronics for the display. The no-frame design makes the unit very appealing for fix installations. Pictured is the model with a straight vertical stand that contains the control electronics for the display. This enables the installation at the exact edge in a wall opening. The no-frame design makes the unit very appealing for fix installations. Pictured is the model with straight table stand, that contains the control electronics for the display. We are a young and ambitious team of specialists, continuously searching for new trends and technologies. We are a department of LANG AG from Lindlar, Germany. Our products are developed, manufactured and marketed under the brand SOLUTIONS4AV. These products are designed for the professional AV business, for the usage in fix installations as well as rental and staging.